If you know what you want to do, you can figure out what you need to read to get there. This tip might be obvious to other people, but I’m not used to planning my reading so that the books are aligned with an overall goal. I make lots of learning plans, with various degrees of following through. Those plans tend to go out the window when I browse through the monthly new release lists on the library website or come across mentions from bibliographies and blog posts. Books are my equivalent of impulse purchases at the supermarket checkout, the pull of slot machines, the intrigue of Kinder eggs. I think that’s how I resist temptations like that. The library is where I let that impulse out to play. We’ve checked out more than 400 books from the library this year. I’ve skimmed through most of them, although I’ve taken notes from a much smaller collection. Since there’s such a trove of free resources I can go through, I find it difficult to spend on books. Before last week, the last time I bought a book was November 2013. I suspect this is silly. The cost of a book is almost always less than the cost of taking the author out to lunch for discussion and brain-picking (and that’s pretty much Not Going to Happen anyway). It’s certainly less than the cost of figuring things out myself. My reluctance often comes from an uncertainty about whether there’ll be enough in the book, or whether it’ll be the same concepts I’ve already read about, just given new clothes. I have to remember that I can get more out of a book than what the author put into it. A book isn’t just a collection of insights. It’s a list of questions to explore. It’s a bibliography. It’s a link in the conversation and a shorthand for concepts. It’s an education on writing style and organization. 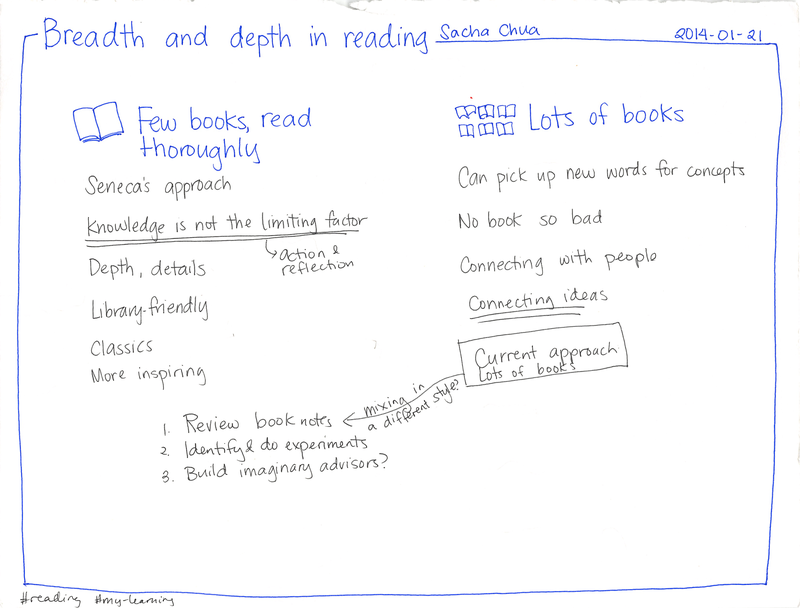 It’s sketchnoting practice and raw material for blog posts. It’s fuel for connection. Phrased that way, books are a bargain. Even not particularly good ones. Hmm. Maybe I should take the “Connection” part of my budget – the part that I’m supposed to be forcing myself to use for taking people out to coffee or lunch, the part that I never end up using all that much anyway – and experiment with using it for books. I’m more comfortable when I use my money deliberately, so I also want to be deliberate about the books I buy. All books are bought – some with money, but all with time. This requires a plan, and this requires follow-through. 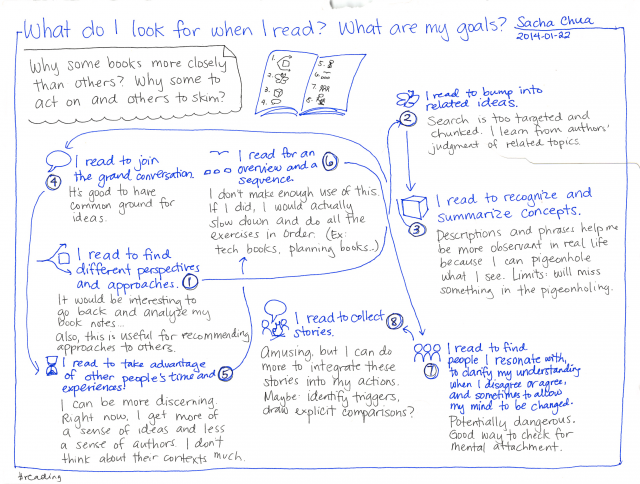 There are holes in the way I learn from books, the pipeline from acquisition to reading to notes to action to review. I want to become a better reader. My inner cheapskate says: practise on free books. But money can be a useful form of commitment too. Anyway. A plan. It seems logical to decide on what I should proactively seek out and read by thinking about what I want to do. It also seems logical to require proof of my learning through writing blog posts and resources and maybe even books, the way students focus on final projects and consultants are measured by deliverables. An approach for learning intermediate Emacs: After you’ve gotten the hang of the basics, how can you keep learning more about using and tweaking this text editor? This will probably take many forms: small weekly tips for constant improvement, Emacs Lisp and Org Mode courses, and so forth. What is the change I want to make in myself? After doing this, I want to be an even better user of Emacs. I want to work more efficiently and fluently, and I want to have more fun with it too. 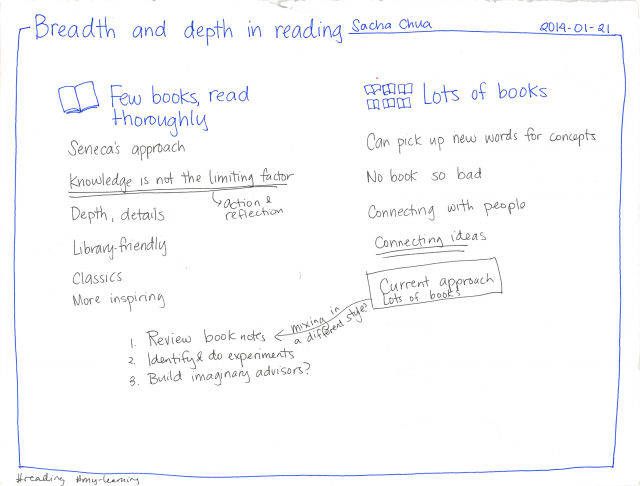 A guide for creating your own personal knowledge management system: I doubt that a one-size-fits-all solution will work, at least not with our current understanding. But I want to learn more about different approaches, I want to make mine totally awesome, and I want to help people build their own from the pieces that are already out there. What is the change I want to make in myself? After doing this, I want to have a wonderfully organized system that lets me easily capture, review, make sense of, and share what I know. I also want to have the vocabulary and concepts to be able to critically examine this system, spot gaps or opportunities for improvement, and make things better. Tips for self-directed learning and experimentation: How to structure your time and learning, how to recognize and explore interesting questions, how to take notes, how to make sense of things, and so on. I want to learn more effectively, and I want to help other people learn more effectively too. What is the change I want to make in myself? After doing this, I want to be able to structure courses of study for myself, take great notes, build useful resources, and accumulate new knowledge. What is the change I want to make in myself? After doing this, I want to have a smooth workflow for learning and sharing. I want to have a wide network of people who can build on the stuff I’m learning about, and who get manageable updates that are scoped to their interests. What is the change I want to make in myself? After doing this, I want to be more fluent in using visual tools to explore thoughts and figure things out. I want to improve in terms of visual organization, technique, clarity, explanation, integration into my self-directed workflow, and so on. Something about how to follow the butterflies of your interest, because I rarely see this perspective in productivity books and because it’s something other people might find helpful. What is the change I want to make in myself? I want to get better at going with the grain of my energy, doing what I want to do (and doing the work that helps me want what is good to want). Who would find this useful? People with many interests – scanners, multi-potentialites, Renaissance-people-to-be. Hmm. I’ve done literature reviews before, collecting quotes and references and connecting things to each other. I can do that again. It doesn’t mean giving up my impulse reads, my openness to serendipity and surprise. It simply means choosing something I want to learn more about and then taking it all in, with more awareness and less evaluation, so that I can get a sense of the whole. This will help me find the things that have already been written so that I don’t have to write them again. This will help me collect different approaches and ideas so that I can springboard off them. I like books with references more than I like books without them. Books with few references feel like they float unanchored. I recognize ideas but feel weird about the lack of attribution. There are no links where I can explore a concept in depth. On the other hand, too many references and quotes make a book feel like a pastiche with little added, a collection of quotes glued together with bubblegum and string. A good balance makes a book feel like it builds on what has gone before while adding something new. I want to write books and resources like that, and if I’m going to do so, I need notes so that I can trace ideas back to where people can learn more about them, and so I can make sense of that conversation as a whole. Deliberate study helps with that. What topics will you read about in 2015, and why? What are the changes you want to make in yourself, what are the resources you can build for others, and what books can you build on to get there? A long reflection on getting more out of each hour, on how taking the right perspective can help me get multiple times the value of each hour. My particular weakness when it comes to reading is that I can end up skimming lots of books without deeply absorbing new insights or triggering new actions. I get practically all of my books from the library. I check their lists of new acquisitions (updated on the 15th of every month) and request all the titles that look interesting. Having gone through a huge number of books, I find myself less patient with books that don’t teach me something new, or at least say things in a more memorable way. When do I get the most value from the books I read? How do I shift my reading to more of that? E-books might expand more of my reading time to the subway, displacing gaming time. If I read by topic instead of getting most things through new releases, then I’ll be reading more intentionally. What am I curious about these days? Skills, mostly, along with the occasional bit of personal finance and small business management. Those topics lend themselves easily to application and experimentation, so then I’ll learn even more from experience. I also enjoy coming across the context of familiar quotes and concepts, so that’s part of the reason why philosophy books are interesting for me. I’ve got lots of notes that I haven’t turned into blog posts, experiments, and follow-up posts. I like how I’m starting to get a hang of the connections between books. Reviewing will help me connect those dots. 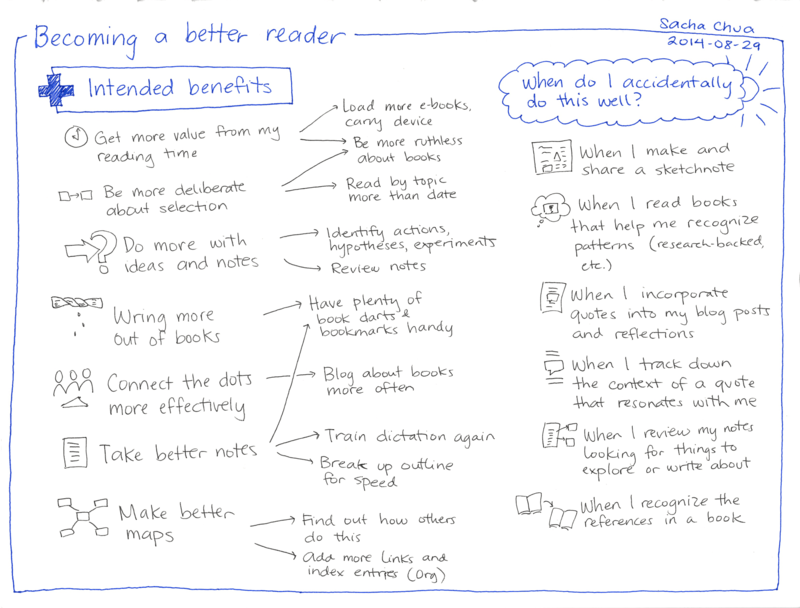 Loved the historical notes on note-taking, indices, and other good things. Learned a lot from this. Very geeky, though. Restricting myself to a small canon feels slightly claustrophobic, but I can see the point of rereading, absorbing, enacting, experimenting, digging deeper. After all, the limiting factor is rarely knowledge. More often, our growth is limited by action and reflection. For personal growth, it’s not a matter of reading more books — although sometimes the right book can unlock some more understanding through a different perspective. I still like the way that reading lots of different books leads to interesting connections between diverse ideas, though, so I don’t think I’ll quite give that up. 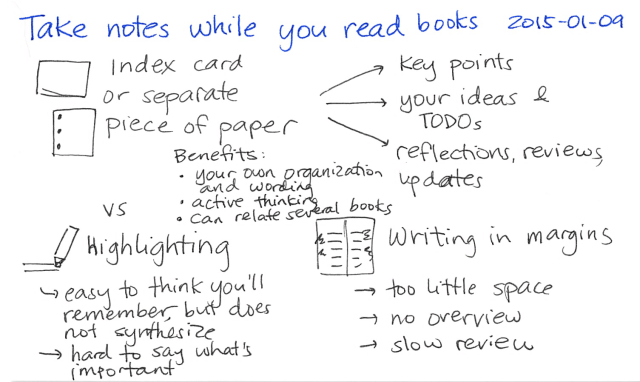 Maybe I’ll just reread particularly good books (or at least my notes of books!) more often, as I set up, go through, and review exercises and experiments associated with them. Why do I read books, anyway? What do I get out of them? If I’m clearer about what I value, then maybe I can get better at choosing promising books, and also at understanding how I feel about various books. I had been looking forward to reading this social media book for a while, but I found myself a little disappointed in it. It was thorough and probably very useful, but it felt… dry. Another book was vibrant with stories, but didn’t translate into actions I was moved to take. Why do I read? What resonates with me? I started by writing down different reasons, and then I ranked them in terms of importance. The results surprised me. What do I look for when I read? – What are my goals? It turns out that I read primarily to find different approaches that I can consider or try out. This probably explains why books that proclaim the One True Method rub me the wrong way. I prefer books that lay out several strategies and describe the situations where each strategy may be more appropriate. I can use those strategies myself, and I can also pick up ideas to share with others. I can still read single-strategy books, but I have to do more of the comparison myself, and there’s always the suspicion of confirmation bias and cherry-picked stories. On a related note, I like the way that books present a collection of ideas. When I search for information on the Net, I often end up with a zoomed-in view and little context. It’s understandable. That’s how I write on my own website – in disconnected chunks. With a well-structured book, I can learn from the related ideas that the authors include. That said, I prefer it if the authors actually worked on figuring out logical connections instead of throwing everything together in a grab-bag of miscellany. 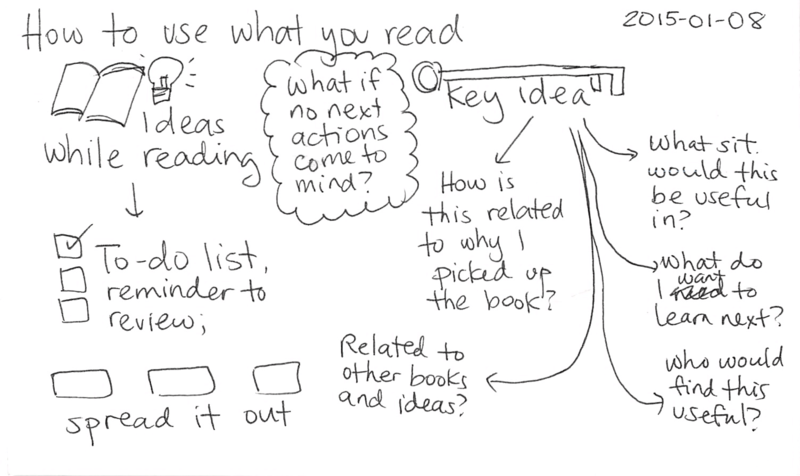 Books are also handy for chunking ideas in a mental shorthand. For example, having read Taleb’s book, I can use the “black swan” as a mental shortcut for thinking about the certainty of unpredictable events. Reading books about communication makes it easier for me to see patterns and work with them. The danger is that I might oversimplify, smooshing real-life observations into these neat pigeonholes – but it’s probably better than not knowing what to even look for. 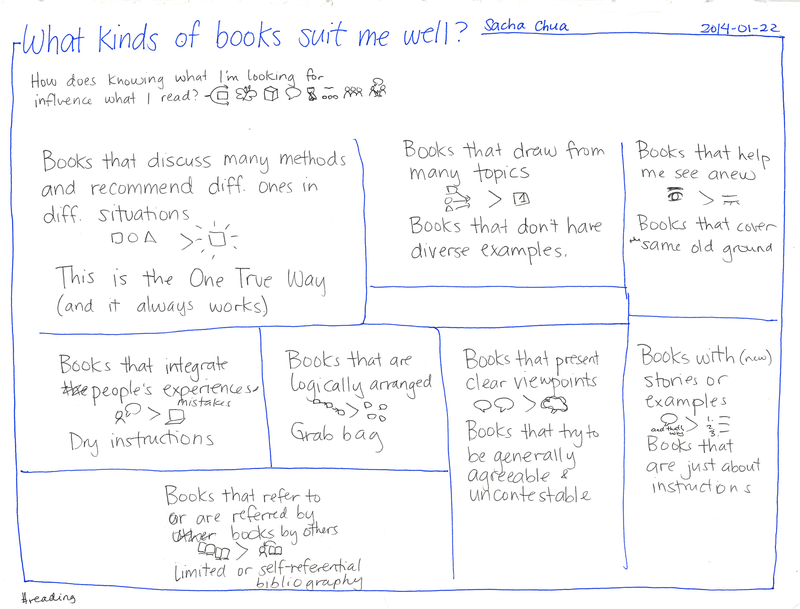 What kinds of books suit me well? There are probably books that suit me better and others that suit me less. I can’t tell all these things from the titles and I refuse to be limited to bestseller recommendations, but I can get a sense of what a book is like from a quick read of a chapter. I’ll still read books outside this model once in a while, but it’s nice to know why some books end up dogeared and others skimmed. As for closer, repeated reading, I think it comes down to being moved to action, identifying the triggers for change and the new actions I want to take, keeping notes on the experiment, and circling back to the book to check my observations against the author’s notes. There’s also this idea of not just being driven by my own questions (since I’m still learning how to ask good questions myself), but to very very carefully pick good teachers and sit at their feet (virtually, of course). Epictetus comes highly recommended throughout the ages, so he might be a good one to start with.